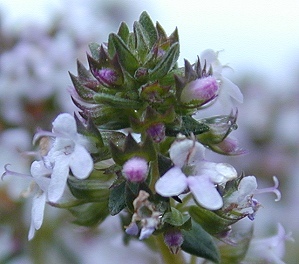 Orange Balsam Thyme is a deviation of Thymus vulgaris, or English Thyme. 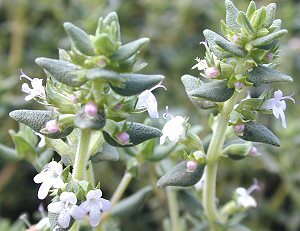 It has a wonderfully pungent scent and flavor and can be used in any recipe calling for Thyme. Orange Balsam Thyme should be pruned back by about a third after bloom. This is easiest if the thyme stems are gathered by the fistful, snipping many at one time. Notice how beautifully the Orange Balsam Thyme spills through the garden. This is a swath about four feet long and two feet wide. As you can see, it is a loosely organized plant that works well here clambering up the side of White Grosso Lavender and flowing under the new reddish shoots of Pink Gaura. 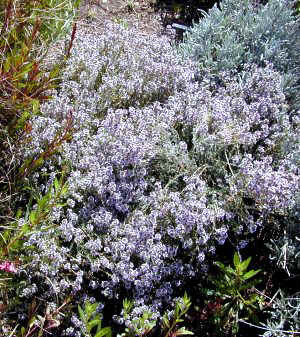 Orange Balsam Thyme makes a tasty addition to our Kitchen Herb Garden Six Pack and our Small Space Herb Garden Six Pack. This plant is often available in plug trays. These trays hold 128 of all the same plant. They are a great low cost way to fill a lot of space. Each cell is 3/4 of inch by an inch. Check here to see if Orange Balsam Thyme Plug Trays are available.